Assassin’s Creed Origins GODS PS4 Xbox One Release Date, Collector’s Edition In Stock! 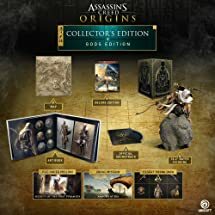 Assassin’s Creed Origins GODS Collector’s Edition In Stock! Pre-orders for the upcoming release Assassin’s Creed Origins GODS Collector’s Edition on PS4 and Xbox One of are back in stock at Amazon! The GODS Collector’s Edition includes the Deluxe Edition game, Bayek figurine, map, soundtrack, and art book. Deluxe game includes bonus mission and bonus Desert Cobra content pack. Assassin’s Creed Origins GODS has a scheduled release date of October 27, 2017. The Collector’s Edition contains all the essentials to discover the mysteries of Ancient Egypt.